I touched on this before but there were a number of reasons we never saw Moorestown in a smartphone. One part of the problem was the number of packages required to implement the platform, the other was that it simply lacked some of the things that smartphone OEMs implicitly expect to live on an SoC. The internal Intel guidance was that Moorestown required 2 packages to implement (Lincroft and Langwell), and in addition to those two you needed an external PMIC and DRAM. There wasn’t support for PoP memory, only external LPDDR1, and there was only support for 5 MP camera and 720p encode. 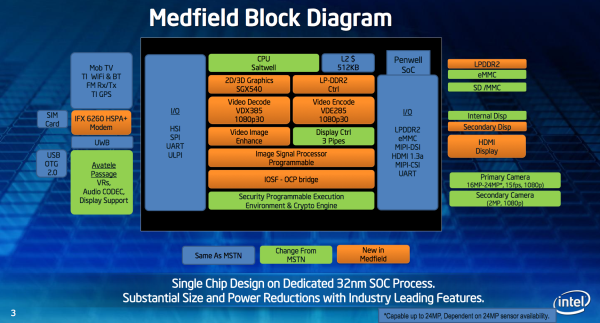 Medfield builds in every way on top of this by delivering a bona fide SoC with PoP LPDDR2 (2 x 32 bit support), improved ISP from Intel’s Silicon Hive acquisition, video encode and decode blocks from Imagination, SGX 540 graphics at 400 MHz, additional I/O, and an external Avatele Passage PMIC (Intel calls this an MSIC). The result is a platform that looks to an OEM like any of the other competitors - it’s a combination of SoC, PMIC, and some PoP LPDDR2, as opposed to the previous solution which required two additional external packages. 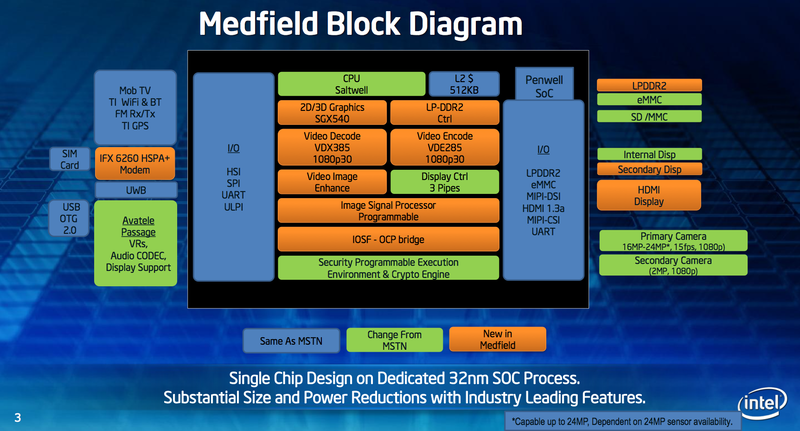 Intel has a few slides online about this evolution and how things have moved inside the single Medfield package, and the result again is something that finally looks like any one of countless ARM-based SoCs. The specific part inside the X900 is an Atom Z2460 32nm SoC (the platform is Medfield, Penwell is the SoC, and the CPU inside is a Saltwell), and inside a Penwell is the Atom Saltwell core running at up to 1.6 GHz with 512KB of L2 cache, a PowerVR SGX 540 GPU at 400 MHz, and a dual channel LPDDR2 memory interface. Anand has already written about the CPU architecture itself pretty comprehensively, and how it compares to ARM’s Cortex A9 and A15 designs. The long and short of it is that Saltwell is still a dual-issue, in-order core with Hyper-Threading support. There’s a 16 stage integer pipeline, no dedicated integer multiply or divide units (they’re shared with the floating point hardware), and in addition to the 512KB L2 cache there’s a separate 256KB SRAM which is lower power and on its own voltage plane. When Saltwell goes into its deepest sleep state, the CPU state and some L2 cache data gets parked here, allowing the CPU voltage to be lowered even more than the SRAM voltage. As expected, with Hyper-Threading the OS sees two logical cores to execute tasks on. The other interesting thing is support for EIST and additional C states when the device is idle. Dynamic CPU clocks through the linux governor is something absolutely critical for getting a smartphone with acceptable battery life. What’s interesting here is that Penwell’s advertised dynamic range is between 100 MHz and 1.6 GHz with fine grained 100 MHz increments between, in addition to the C6 state where CPU state data is saved in the on-SoC low power SRAM and the platform is basically suspended (deep sleep). Or by using an Android application which inspects exactly this data. I spent a day with the Medfield phone in my pocket and made a note of capturing what the state data was after the day’s end, and the CPU does indeed go into C6 while idle and in the pocket, and spend a lot of time at the minimum 600 MHz clock with some bursts to 1.6 GHz when I’m doing things. The reality is that most of the smartphone’s time is really spent idling, waking up only to watch some DRX slots or process background tasks. It is curious to me however that Intel isn’t implementing their Ultra-LFM modes between 100 and 600 MHz - it’s possible there’s no voltage scaling below 600 MHz which in turn doesn’t make it worth jumping into these lower clocks quite yet. Depending on the device’s thermals, Intel’s governor will select between those available frequencies. There actually are four thermal zones in the device, on the back, front, baseband, and SoC itself. The SoC can go up to 90C before you get throttled (which is pretty typical for Intel CPUs), 75 C on the back, 64 C on the front, and 80 C on the modem. Those sound high but aren’t out of the ordinary for some of the other SoCs I’ve seen who have similar thermal management. 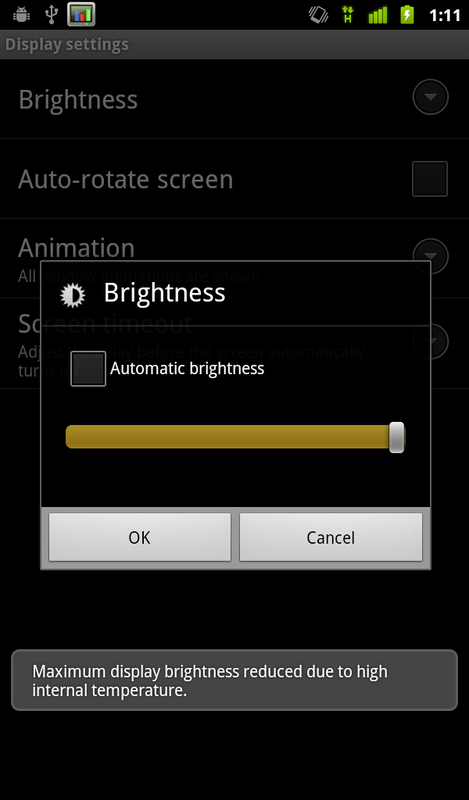 In addition, if the platform gets too hot, the display brightness will be clamped to 50%. I have to admit that I did see the display brightness get clamped once as shown above, but only once during a period where I was running the display at 100% brightness and maxing out the CPU. The bottom back of the X900 can indeed get warm, but nothing inordinate or near the thermals that are set in the software management. 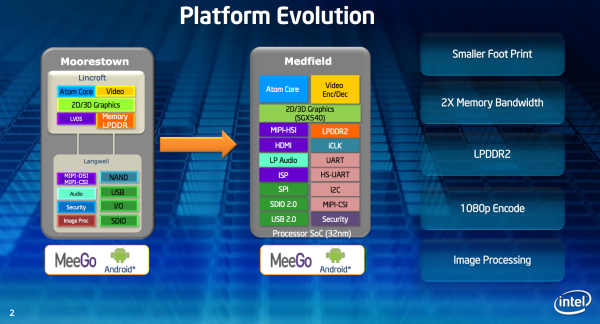 The rest of the Medfield platform we’ll talk about in the appropriate sections, but the big takeaway is that Intel finally has a real x86 SoC for smartphones and tablets. In addition to the Z2460 that we’re looking at in the X900, Intel has two other SKUs which round out the high end and low end. At the low end is the Z2000 which is functionally identical to the Z2460 but with a maximum CPU clock of 1.0 GHz, no HT, and an SGX 540 clock of 320 MHz, and the Z2580 which is clearly targeted at Windows 8 tablets with two Saltwell cores clocked up to 1.8 GHz, and PowerVR SGX544MP2 graphics at 533 MHz for Direct3D 9_3 compliance. Since Phone Maker can just buy a reference design from ARM, and all other parts, then Fab them with TSMC, the only cost is a Engineering Team and Fab Cost. For Phone Maker with Large Volume, The Total cost of SoC is much cheaper then say buying from Nvidia. Not necessarily true. Since Intel could be using it as a loss leader to take marketshare even at 0 profit. The desktop non-SoC Atom pricing starts around $40 (based on their pricelist), while something like Tegra2 is in the below $20 and Tegra3 supposedly in the $20's. If Intel "sells" for little to no profit, then it could be price competitive for the people buying it. Nvidia has to make some profit, because they are far smaller with less bank account than Intel. Intel's own current pricing of Atom shows they are way out there based on their current operating margins, but again that's not their initial goal anyway. Given that Intel had to spend lots to develop the reference design and port Android, they clearly invested massive R&D into the project. They have offered this service to anyone wanting to sell the phone without extra cost, you can't take an Nvidia reference and sell it as they don't do final designs and software. So they don't care about the time schedule as long as they can get marketshare, but they offer a fully manufacturable product, just like GPU reference design boards AMD and Nvidia offer. "Intel's Oak Trail platform, paired Atom Z670 CPU (US$75) with SM35 chipsets (US$20) for tablet PC machine, is priced at US$95, already accounting for about 40% of the total cost of a tablet PC, even with a 70-80% discount, the platform is still far less attractive than Nvidia's Tegra 2 at around US$20." Thats purely your opinion and i'm sure you're a minority. Many people are not even going to consider this because of it's thickness.